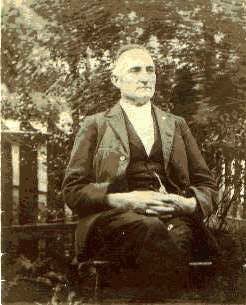 My maternal grandmother’s father was Joseph Henry Keithley. He was the son of Enoch Keithley and Amy Turner born in New Diggings, Wisconsin on October 18, 1853. New Diggings was a community established in 1826 when miners were looking for new places to dig for lead and found that area rich in lead deposits. In reading about the early history of that community, I learned that many of the miners had come from Missouri, which was the case with Joseph’s father. While searching for information on New Diggings I found a page of an artist who has done some panorama paintings of the small community. I had posted a picture of the general store (built in 1844), which is included on the artist’s panorama, on the blog I did about Joseph’s father. 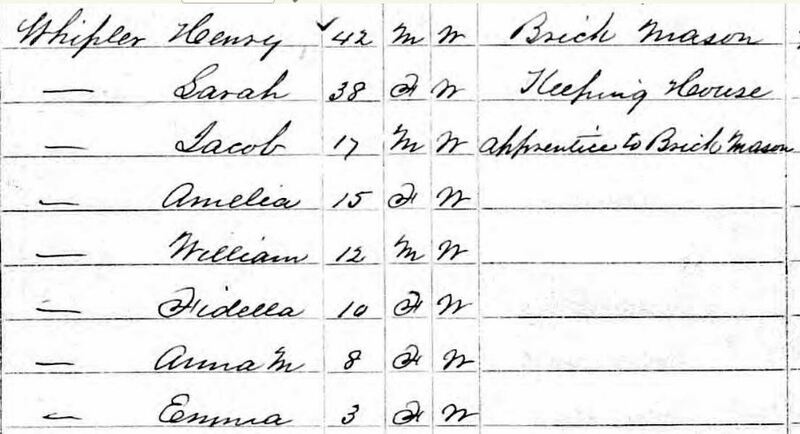 When Joseph was 1 1/2 years old, the 1855 Wisconsin census for New Diggings listed the Enoch Keithley family with two males and one female: By the time of the 1860 census, Joseph was 6 and his family was living in Shullsburg, Wisconsin, which was 7 miles northeast of New Diggings. Joseph now had two siblings – brothers Arthur (4) and Lewis (3): In November 1861 when Joseph was 7 years old, his father enlisted in the Union Army and left for Pittsburg Landing where he died in April 1862. His mother Amy married Thomas Burgess in October 1862 and in January 1864 they had a daughter named Edith “Sarah” Burgess. Unfortunately, Thomas deserted the family and Amy and her three sons and a daughter moved to Fairview, Illinois where her parents and some of her siblings had moved. The 1870 census enumerates Amy and Edith in one household (52) while Joseph was enumerated as a laborer in another household (108), Lewis in another household (128) and Arthur was enumerated in another county over 50 miles away. These census entries reflect the dire, though not necessarily unusual, circumstance of children having to hire out to other families in order to have a place to live and food to eat. By the 1880 census, Joseph was listed as head of a household that included his mother and half-sister as well as his two-year-old niece (daughter of Amy’s brother George whose wife had died). Arthur was living in Peoria where he spent the rest of his life, and Lewis was enumerated in Seward County, Nebraska where he was working as a farm laborer and living as a boarder. Joseph married Martha Ann Conn in Chicago on January 20, 1881. In writing what we know and don’t know about Martha, Kay included their marriage license in a blog. Because we have no information on Martha other than her name, we do not know where or how they met. Their first child, a daughter named Violet Belle, was born November 4, 1881 in Fairview. In 1882, Joseph and Martha purchased a tract of land in the surrounding countryside, presumably to build a home to raise their family and to farm it. On a trip to Fairview in 2008, a local woman drove Kay and me out to see the land they purchased; it is currently vacant farmland. On January 20, 1883, my grandmother, Eva, was born and her brother, Leo, was said to be born November 17, 1883. That date may indicate at least a slightly premature birth for Leo. We have birth certificates for both Violet and Eva but a certificate was not found in Fulton County for Leo; however, his WWI draft registration lists his birth date, although it is not uncommon for WWI draft registrations to be off by a year. Due to the lack of an 1890 census, details of Joseph’s life from the birth dates of his children to the 1900 census have to be inferred from other pieces of information. Joseph and Martha moved to Missouri between 1884 and 1889 when their last daughter, Mabel was born. Martha died either in childbirth or shortly thereafter. No birth record for Mabel or death record for Martha has as yet been located. The care for Violet, Eva and Leo was apparently taken over by family members but no one stepped up to take on the responsibility of an infant, so Mabel was adopted by Henry and Sarah Whippler. I have found records of them living in a nearby county and of one of their sons living in the town of Carterville, which is where Joseph was living in 1900. Joseph married Sarah Oliver in Carthage, Missouri on October 6, 1892. Their son, Arthur Enoch, was born in Carthage on November 8, 1893. Their daughter, Susannah ‘Susie’, was born June 24, 1895. Both the 1900 and 1910 censuses indicate Sarah was the mother of three children, so it is assumed there was either a stillborn child or one who died as an infant. By the 1900 census, they were living in the town of Carterville where Joseph owned property and operated a grocery store. Joseph’s family was at least partially reunited; both Eva and Leo were living with their father and stepmother along with Arthur, Susannah and Joseph’s Uncle W. R. Keithley. His daughter, Violet, had recently married and was enumerated next door along with her husband and two of his children from a previous marriage. Mabel was living with her adopted family in Wisconsin. On November 16, 1906, Joseph and Sarah’s daughter Susie died at the age of 11. Joseph was active in the Methodist Episcopal Church, a member of Woodmen of the World and an active participant in the Retail Merchants Association. Early in the morning on Valentine’s Day, February 14, 1911, Arthur found his father lying on the floor in the store having had a stroke. He managed to get him back to the house where a doctor was summoned but Joseph was pronounced dead at 7:00 a.m. At the time of his death, Joseph was President of the Retail Merchant’s Association and so several articles regarding his death, funeral and impact on the local businesses were available in the newspaper. Kay wrote a blog in which she included photos of his headstone and one of the newspaper articles. Joseph was buried at the Dudman Springs Cemetery in Sarcoxie (a small community not far from either Joplin or Carterville). He is buried near Susie and his wife, Sarah, who died in 1915.